Teletronics' EZPlatform? is Linux based Open-WRT configurated PCBA, and is designed for OEM enterprise and/ or residential applications, with either single or dual frequency for outdoor environment. The bareboard can be used either as router, repeater, bridge, or AP, and as such allows clients to use their own application software or open Linux application software and to integrate in their own way into their proprietary systems. The EZPlatform™ – Network Computer is designed for enterprise and residential network applications. Selling at $200 per piece, The EZP-1000 is a general purpose, flexible, easy to configure, and a multi-peripheral incorporable motherboard. As an off-the-shelf board, the system integrators are able to implement its own dedicated or even brand-name system. Most common uses include broadband wireless routing and repeating using 802.11 radio cards, either one or two, at selected frequencies of 900MH, 2.4GHz, or 5.8GHz, under a sufficient RF power levels, as required for indoor or outdoor applications. The EZP-1000 has also the versatility to be used as a low cost and comparable performance alterative of WiMax (either base station or client unit). With its two serial ports and two Ethernet ports, the EZP can easily incorporate GPS, GPRS, RFID, VoIP, surveillance camera, field meters, motion sensors and data networks for multiple industrial and commercial applications with wireless broadband transmissions. From performance feature viewpoint, the EZP-1000 is a Linux-based platform which can readily be applied to generic network appliances as a firewall, bandwidth controller, access controller, VPN gateway and/or router. In all configurations, the two Ehternet ports offer multiple connectivities, for IP-based voice, data and digital video. Teletronics offers engineering support for special developments under customer request. Appropriate case, radio cards and antenna will also be recommended. Different from those “comparable” multi-slot router products in the market, the EZPlatform™ has an innovative PoE design which adopts to a wide-range of DC power sources, from 10 to 60 VDC, allowing the platform to be suitable for use in boats, RVs, buses, Internet hotspots and long range IP-based data-link relays. The radio cards can be highpower cards. 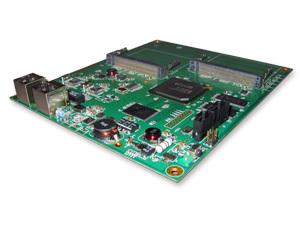 It supports Linux 2.6 Kernel with flexible manufacturing options and RoHS compliance. At designated frequencies of 700MHz, 900MHz, 2.4GHz, 3.5GHz, 4.4GHz, 5.4GHz or 5.8GHz cards, EZP-1000 increases the mini PCI power spec from a max of 2.5W to a total of 15W for all two sockets.